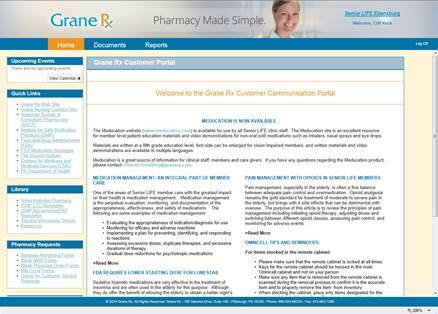 Pittsburgh, July 30, 2014 — Grane Rx, a leading provider of pharmacy services to the long-term care and PACE industries, launched a new customer online solution in July 2014, according to Bob Rowland, Chief Operating Officer. True to its name, the new SimpleView system will make it fast and easy for our customers to access real-time clinical and financial information that support customer needs. For example, long-term care facilities use EHR (Electronic Health Record) systems to track critical patient information. But there are often gaps in the real-time information that these systems provide. SimpleView runs hand in hand with EHR systems and fills those gaps with the touch of a mouse. SimpleView is HIPAA compliant and tested, to ensure the security and privacy of resident information. Foundation functions: medication alerts; pharmacy communications; real-time reporting for billing, clinical, medical records, high-cost drugs, prescribing trends, audits and consulting. Deeper patient-focused functions: multi-lingual medication instructions, resident medication profile analyses, refill requests and change orders. Advanced functions: e-prescribing for controlled substances, customizable dashboards, analytics, trending, e-charting and drug cost estimates. Once SimpleView is available, long-term care facilities can schedule a demo by contacting Scott Sosso, Director of Business Development at ssosso@granerx.com. Or call 412-449-0504.